Smoked Sausage was not something that was a familiar ingredient in my home when I was growing up. I had never even heard of it. I discovered it shortly after I moved out to Western Canada as a young Bride . . . It was love at first bite. Kielbasa . . . Polish Sausage . . . whatever you call it. It's delicious and it's also a very versatile ingredient to have in your refrigerator or freezer. It comes in very useful and means that you will always have a delicious and quick, if simple, meal ready to hand when you want it. This is something that I used make every so often for my family through the years. It used things that I always had on hand . . . potatoes, onions . . . smoked sausage, cheese . . . and it went together very quickly, which was a real bonus with 5 growing children and a big house to care for! Simple, delicious and economical . . . all plus's in a young mum's books! Add to that the fact that my kids loved it, and you had a real winner on your hands. It's not something I make really often these days . . . let's face it, my aging thighs don't need all those calories . . . and it's probably not the healthiest dish for people to indulge in very often, but as a once in a blue moon treat, and a store cupboard meal, it goes down as a real treat. It's also very easy to double or halve, which makes it pretty convenient as well. An easy and simple meal that is also economical . . . oh, and pretty delicious too!! Preheat the oven to 200*C/400*F/ gas mark 6. Line a large baking tray (with sides) with several sheets of foil, and drizzle with a bit of oil. Spread the oil out over the pan. Set aside. oh my gosh this looks like home to me, we ate this so many times, yum!!!! Marie!!! I couldn't find a way to comment so I'm hoping you see this lol. I don't have thyme. Would garlic pair well with paprika? Paprika is a smoky-sweet sort of taste, while garlic is (unless it's been carefully sautéed) kind of earthy and bitter. If you lack thyme, I'd either leave it out or sub it in for oregano if you want the dark taste of thyme, or rosemary if you want the same texture and don't mind a pop of bright, faint mint. Hope that helps! This is a great recipe! 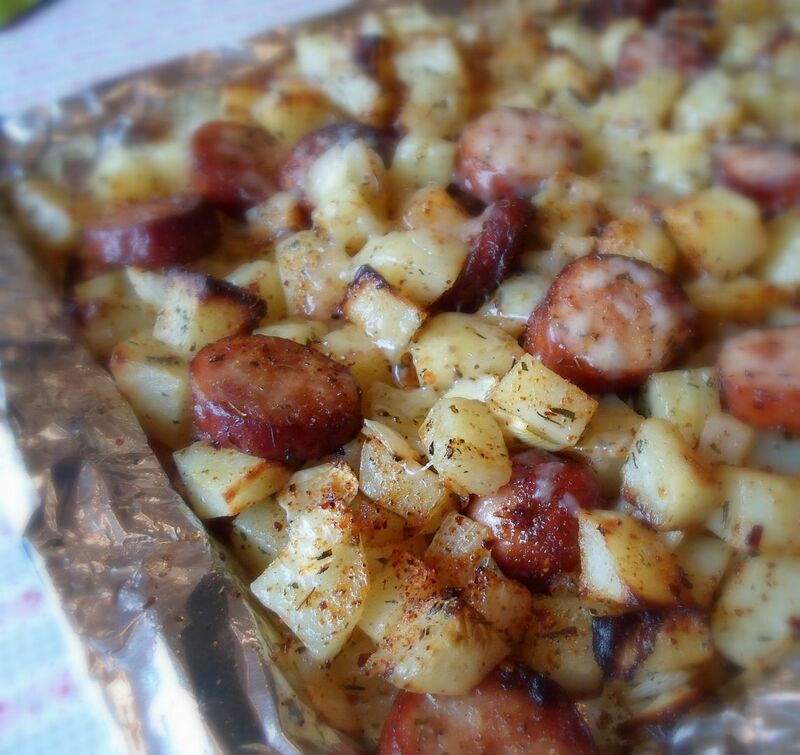 I saw it pinned on Pintest on the day I needed it (I was looking for a recipe combining potatoes and smoked sausage). Took it to a baby shower and it was a BIG HIT. So happy you enjoyed it Jschwab! It's a winner for sure. Would garlic pair well with paprika? I have never frozen it actually. It's been my experience that freezing potatoes doesn't work very well. They usually get very mushy. You could cut the recipe down quite easily to a small size if you were thinking you would have too much. I do that all the time as there are only two of us. I am so not a cook, at all. I made this for dinner this evening. It was so easy to make and was sooo good!! My son loved it, too!! Thanks so much for sharing!! So glad you enjoyed this Dana. These are the types of dishes I enjoy most, simple, hearty and delicious! We are making this now but not baked. Frying in olive oil. Baked is much better. Must try it. About how many cups are 5 large baking potatoes? I am making this evening for my husband. Hi Rita, I am guessing I did not see this in time. I would think a large baking potato would yield slightly more than a cup, so I would say about 6 cups? That is only a guess! This is a family favorite! I make it every other week and my family looks forward to it every time. Especially the guys!! I am not sure how to add a pin button to this page Tracey. I will have to try to figure it out!! Great recipe. I do something similar in the crockpot only I use cheddar cheese soup. I have tried a variation of this recipe, substituting the potatoes with sweet potatoes, and its awesome! Instead of potatoes I use sweet potatoes and it is a hit with my family! What a fabulous idea! I can't wait to try it with sweet potatoes! Thanks J. Martens. I am obviously a very old dog because even with the link I can't figure it out! I need a teen in the house! TeachFitMom, that sounds a tasty sub! I am so excited To find this recipe. My daughter just had a baby and everyone has been bringing them fried chicken and pizza. I wanted to fix them something hardy and different! Perfect! Congratulations on the new grandchild Beth! Is there an easy way to print these recipes out? I can't seem to find a print button... unless I'm just not looking in the right spot. Fabulous recipes that I would love to save! Lori, thanks for your lovely comment. There is a printable recipe button beneath the serving size of each recipe. That is a link which will take you to the printable page, and then you can click on the print me button at the bottom of that page. Hope this helps! This looks delicious & perfect for a cold night :) Cannot wait to try it! I hope you do and that you enjoy it kingandqueen! This looks so good & I figured out how to pin it. Found other pins but they didn't go anywhere. My pin will lead people here :) Anyways can't wait to try it! Thanks Dawn! Hope you enjoy it! Made this tonight - it was awesome! Simple and we all loved it. Jennifer, thank you so much for taking the time to come back and let us know! So happy you all enjoyed! Have you ever added green peppers to this? I have one I need to use before it goes bad. Can't imagine these ingredients not going together.. ha! I think peppers would make a great addition Rachel! 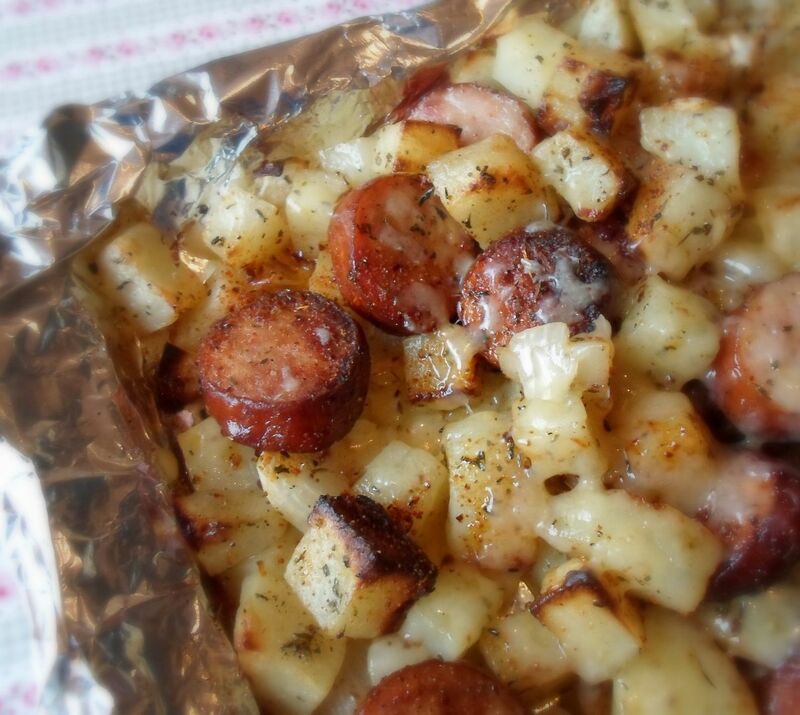 For an even quicker meal, could you use the refrigerated prepackaged diced potatoes? They even have kinds that come complete with onions and peppers. Since the sausage is already cooked, it would probably only take twenty minutes or do to heat everything up. For an even quicker version, I would think you could use the refrigerated diced potatoes in a package. There are even kinds with peppers and onions. As the sausage is already cooked, I figured about 20 minutes at 400° would be enough to heat everything up. Sound good yo you? That does sound like a fab idea Carole, and very time saving as well. I just with we could get those over here in the UK. Thanks so much for sharing! 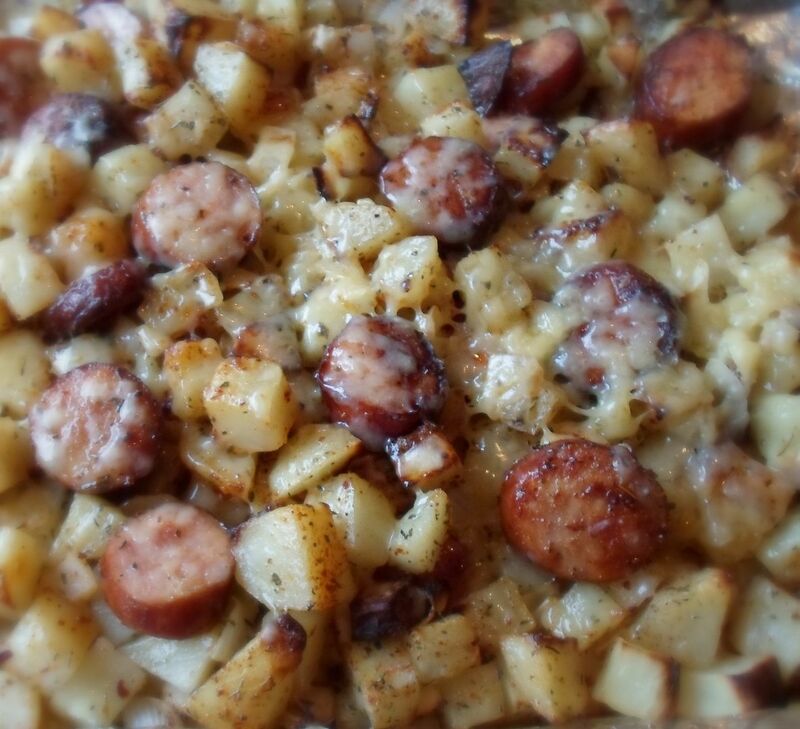 Made this for supper tonight, but as it was Boys Night on the homefront [mom and grandma both working still...] I added some extra taters and doubled the sausage. If you think regular people like this, you should see men and teenagers go after it!!! There's just enough for my D-i-L to get a decent taste! We will eat this again, and soon. I like to cook, but something like this, easy / cheesy, is never a bad go to for a Boys Night. 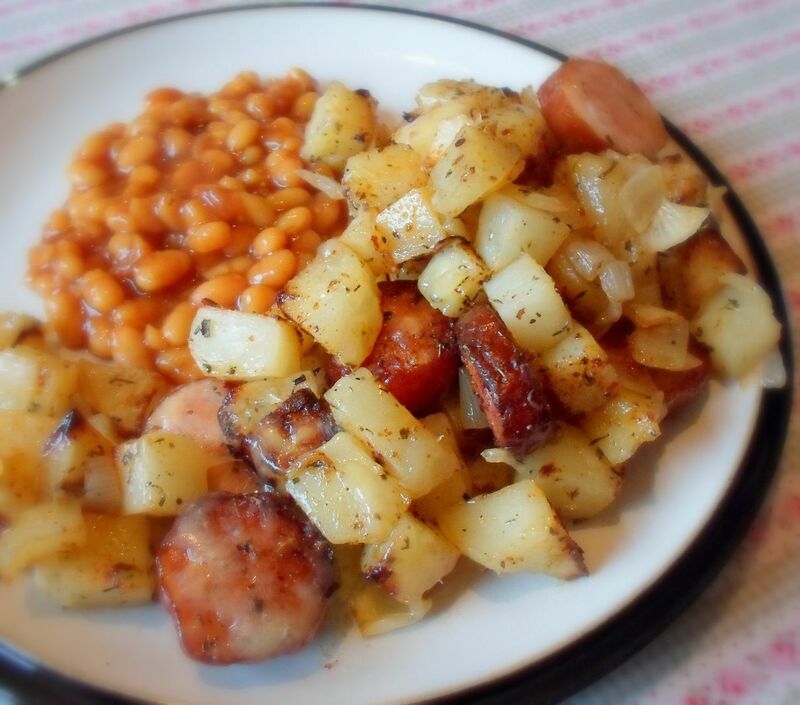 And as I always have sausage in the freezer, and potatoes in the cupboard...no brainer time. I am a no brainer kind of cook Schtevo R! I had some left over pico de gallo and added it. It was just as good as you think! I added some left over pico de gallo. It was as good as you think it was! I've made this a few times since I found it. My family loves it! Sometimes I use it as a way to get rid of a fridge full of veggies. Last night I added bell peppers & asparagus to the mix just because I needed to use them up and it was really good. Thanks for sharing! Those frozen hash brown potatoes would make it even easier! We made this for dinner tonight. Used low fat turkey sausage and added some parsley. Served with some steamed broccoli. It was wonderfully yummy! We all loved it and it has been requested to be made again soon. Thank you for sharing! I made this for dinner tonight and everyone loved it. That rarely happens around here. I used red potatoes and no onions; put some minced garlic in when I tossed it with the seasonings. My husband said it is one of his favorite recipes I have tried. Definately a keeper! I made this using turkey kielbasa since my husband now has an allergy to beef and pork since he was bitten by a Lone Star Tick. It was excellent using the turkey and a lot lower in calories. I'm making it again tonight. Thanks for the recipe. Not sure if I got the potato sizes (?) wrong, but the mixture didn't spread out very flat and is taking over an hour and fifteen to cook, what am I doing wrong!? 1/2 inch cubes of potato Katy and on a pan large enough you can spread them out in a single layer. The times should work well if you do that. Made this for dinner tonight! Wonderful and easy, thanks for sharing. This is what I use. A package of this. You don't always need to remove the rind. Some have a rind and others do not. Lea-Ellen, Packaged pre-cooked Kielbasa sausage is available for sale in the refrigerated meat section of any supermarket. You can choose all beef or regular Kielbasa. A popular national brand is Hillshire Farms. I believe a package weighs about a pound. No need to remove the casing. Unpackaged Kielbasa is also usually available at the market's meat counter. Thanks Oceo! That's been very helpful! I just tried this today. They taste really good, but the problem ia getting the cooking time down. I followed this recipe exactly, and my potatoes were not cooked through. I've had them in the oven for two hours now and rhey are still not cooked through. I wonder if there was some confusion on the temperature? There are two temps listed, one is Celsius and the other is Fahrenheit. Maybe you used the wrong one? It would take forever to bake the potatoes at 200° Fahrenheit. Rebecca, perhaps you have cut your potatoes too large or there is a problem with your oven's thermostat?? I have never had that problem. Potatoes cut in 1/2 inch cubes, and stirred every fifteen minutes should certainly be cooked within 45 minutes to an hour. You could bake a whole potato at that temperature for an hour and it would be cooked through. I think your oven must be really messed up. I want this for breakfast along side soft-cooked or fried eggs. I've made this a few times now. It's so yummy! I don't think it needs to cook for 45 mins. I've found that 30-40 mins is the perfect spot for us. 45 mins and the potatoes started to get mushy. Just wondering what sides you make with this. Making for dinner tonight! Hi Shannon, I usually have baked beans and coleslaw or a tossed salad with this! I hope you enjoy it! I don't know if anyone has suggested this yet but I enjoy tossing in a packet of ranch dressing mix along with some Cajun seasoning that I mixed together and that really hits the spot for me. That sounds mighty tasty Matthew! Thanks for sharing! Trying it out now. Ekk...I added cayenne pepper twice instead of garlic powder (all I had on hand, no fresh garlic) so it will be interesting. Decided to add rolls and baked beans just in case! I will let you know. 75% of the meal had to get thrown out because it stuck on the aluminum foil. I would definitely make it again but I would omit the aluminum foil and use a good non stick baking sheet instead. Could you use frozen potatoes? I have a bag of O'Brien potatoes and this would be a perfect recipe. Thanks!! I can't think of why not Jolene! Sounds a perfect substitution, but obviously the cook time would be a lot less than the original recipe. let us know how you get on! I'm not a natural cook but can follow a recipe. How much thyme and paprika? It is meant to be to your own taste Dennise, but I would say 1/2 tsp dried thyme and 1/4 tsp paprika. Cover or uncovered to bake? It is baked uncovered Nikki. I made this for my family tonight and they loved it! The only thing that I think you need to add is estimate measurements for the spices. It's just good to have a ballpark idea of how much to use. I see you said 1/2 tsp of thyme above and I wish I'd known that because I put a tablespoon and I think that was just too much. Overall, great dish. Thanks for sharing! Glad you enjoyed Shanna despite your overuse of thyme. I suppose I was thinking when I put according to taste most people would have some idea of how much to use. I will suggest in the recipe how much. Thanks! I didn't think this would be all that good. Really thought it would be bland but wanted to give it a try. It was amazing! I didn't have any thyme so I used the italian seasoning I had on hand and it worked out just great! A day later my daughter is asking for this to be made again! delicious!!!!! i wasn't really hungry but i ate 2 helpings! Marie, for a novice cook would you include the measure for the seasonings? Thank you very much. Gamecock cook, for seasonings I would start with 1/2 tsp salt, 1/4 tsp pepper and 1/2 tsp thyme. You can always add a bit more after if you don't think it is enough! So happy it is enjoyed Heth! What kind of potatoes should I use? Brown, red or yellow?? I recommend a good all rounder, a red would probably do the job very well. This is in the oven now. I sprinkled a little bit of cheese in with it maybe 3/4 cup fine shredded mild cheddar. Instead of thyme or paprika, I used half a packet of ranch dip mix. It smells amazing. My husband's aunt bakes potato chunks in butter and ranch dip mix so I knew it would go well. I used half a package so it wasn't so strong. I kicked it up a notch with extra seasonings. Cooking right now in the oven. Thanks for the recipe! Thanks Joy! I hope you enjoy it! Extra seasoning sounds fab! This was a big hit with my hubby last night! Thanks again! I have all the Ingredients. except I have a bag of frozen Cubed Potatoes. Can I use them in a pinch? I think you could use them in a pinch Cindy, although freak are preferred! Let me know how you get on! The first time that I looked at this recipe, I thought to myself, "This person must be British !" What a wonderful meal, one that I will be sure to fix within the next couple of days to use up some sausage that I have. Thank you ! Thanks Leamlass! Canadian by birth, British by choice! I hope you enjoy it! This is something I have made for my family fairly often over the years, Salt, pepper and parsley and cloves of garlic.tossed in my family loves garlic. 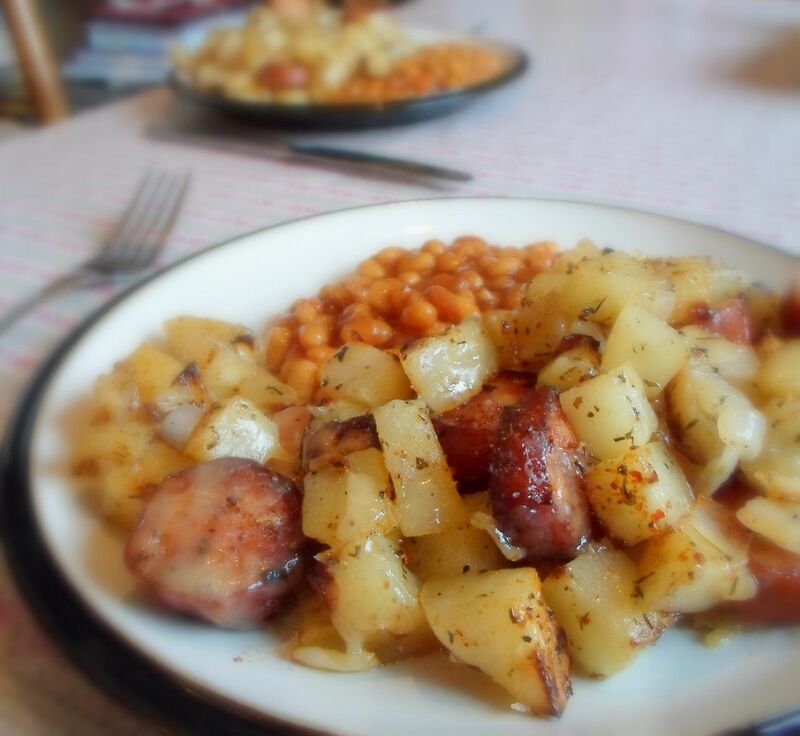 I've used the O'BRien potatoes in the freezer many times when we are in a hurry or throwing together a late meal you don't want to spend a lot of time in the kitchen. I have also replaced the smoked sausage with canned corned beef to make a corned beef hash with a over easy egg on top. DELISH! Penelope, I wish we had the frozen potato products over here that you have in America! Sounds simple and tasty! Just made this! AWESOME! My picky son LOVES it! I did not use the onion, added garlic, oregano instead of Thyme (dont like it thou) , cumin, garlic power and rosemary! YUM! Thank you so much for this wonderful recipe! Ok, really, really dumb question, but is this precooked sausage or raw? Suzi, I use smoked sausage. I am not sure if it is precooked or not. I think you can eat it without cooking it, but I never have. I have fixed this for years, only I made mine in a skillet. I also added about a half a pound of ground sausage. When everything is cooked, I also like to scramble about a half dozen eggs to pour over everything. When the eggs are set, add your cheese to the skillet, then cover long enough for the cheese to melt. Hi Joe, that sounds delicious, but more like a breakfast casserole. I will give it a go sometime though! It sounds ab fab! Fantastic! 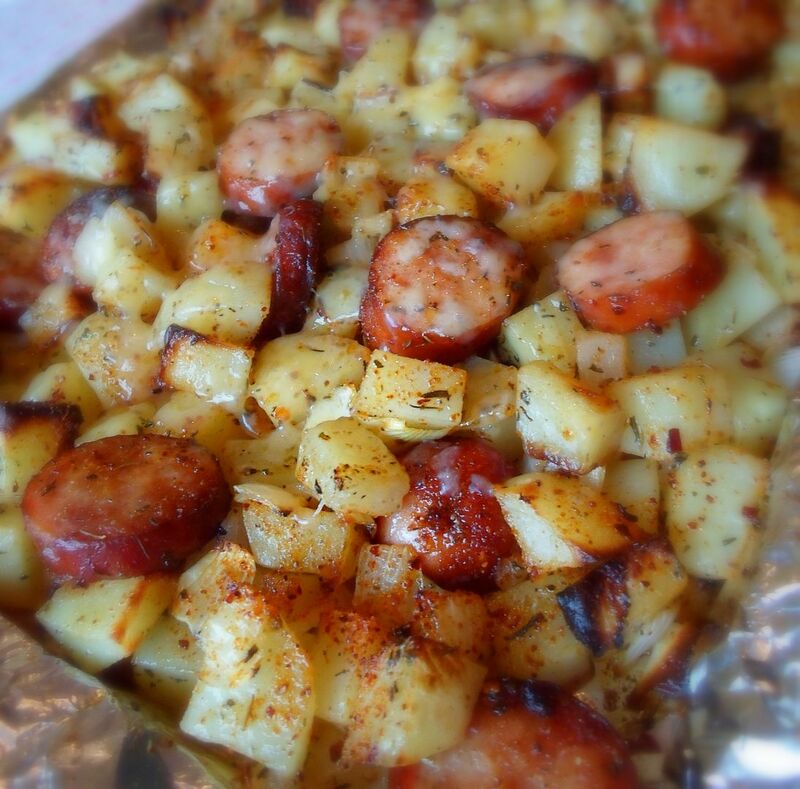 Too lazy to head to store so I Googled up a recipe for what I knew I had... smoked sausage, potatoes and onion. Yours was first... Whipped it up per instructions and it was marvelous! This one is a "Keeper"! Thanks!!! Made this for dinner tonight plus Italian seasoning it was awesome!! I have made something similar to this except I add broccoli. It gives us the veggies we need and still has the yummy taste. We love it. That sounds great dawns A! Amazing! Thank you Marie! I left the peel on my potatoes just because I usually do, it was so delicious! This was really good! I added some leftover bacon and didn't have an onion so I used onion powder instead. Would make this again! So happy it was enjoyed Unknown! I made this lastnight!! It's was so good! Kids and the hubby loved it. We skipped on the thyme though. How big of a pan? And can i use a foil pan? My baking sheet is about 12 by 15, with sides. I don't recommend a foil pan as it would be too thin! I'm sorry if somebody already asked this: I'd like to bring this to a potluck at work, but I have no way of reheating it. Could I make it, then keep it warm in a crock pot? I can't see why not Tiffany! If I cannot reheat this until I get to a potluck (about an hour and a half away), will it still taste okay? definiately going too make yum yum! I grew up with a recipe very similar to this we used to use Red New potatoes though and we would use a bit of paprika and garlic powder. I'm actually making this tonight. However not much for tyme but thas just personal preference. I also tend to serve this over a bed of red beans and rice. I know it's unhealthy and lots of calories but it's ohhhh soooooo goood. Thanks for giving me a bit of a reminiscent reminder of growing up. And kiddos for an awesome recipe. I have made this this awesome recipe, and jacked it up by adding brussel sprouts to it in the last 15 minutes....yum! Thanks Unknown! Hope you enjoy! I am not sure who your comment is directed at Erica. I th No the directions are very clear!